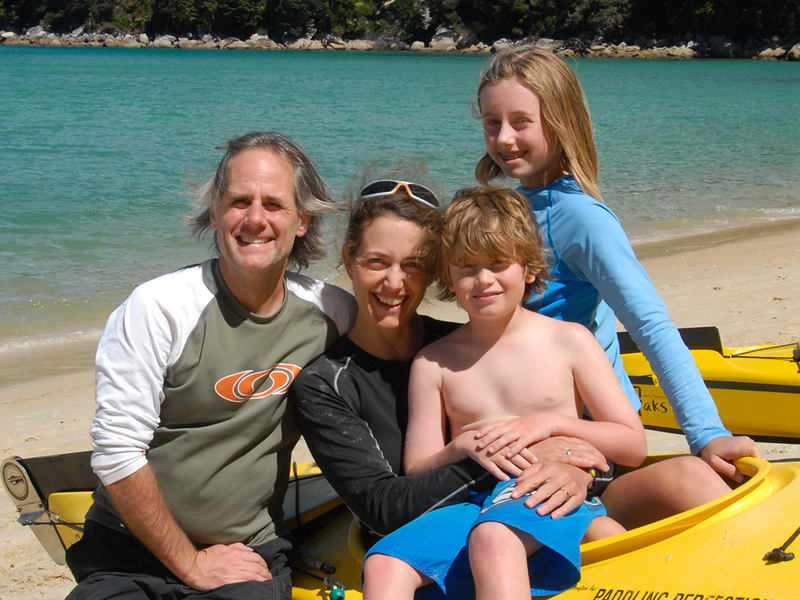 These family kayaking tours in the South Island combine stunning scenery, challenging waterways, and unique wildlife. 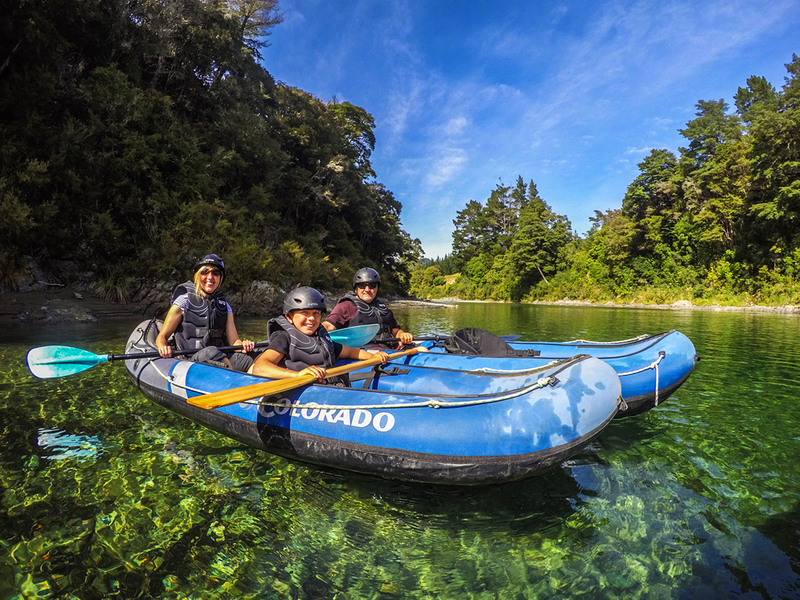 Twisting from gentle winding waterways to heart-racing rapids between pristine native bush and stunning rock features, a trip down the Pelorus is one you won’t forget in a hurry. Sir Peter Jackson was so taken by the Pelorus that he chose it as the location to film the memorable barrel-escape scene in The Hobbit: The Desolation of Smaug. A full family-friendly kayak tour down the Pelorus river — including the stretch used in filming The Hobbit — can be done in half a day, leaving from Havelock in the morning and afternoon. The Abel Tasman National Park holds some of New Zealand’s most beautiful beaches: think golden sand, hidden coves, and turquoise water. But the scenery is a lot more dynamic than that, including thick forest and a number of unique rock formations. Abel Tasman also throws in a great climate for good measure, enjoying the highest chance of year-round sunshine in New Zealand. There are several kayak tour companies operating in the National Park, offering anything from a gentle paddle on the lagoon to an extensive, three-day kayak tour along the coast. Fiordland National Park is a UNESCO World Heritage site of cascading waterfalls and dense forest, quiet coves and glass-like waters. The best bit? The still, shimmering fiords and alpine lakes are built for safe, family kayaking! 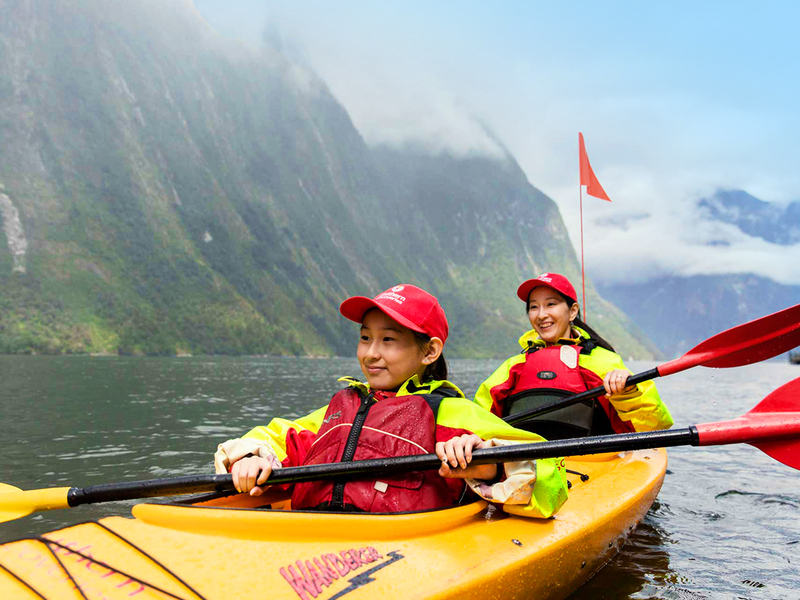 Milford Sound is the more popular and more easily accessible, but if you want to get off the beaten track a bit, take a guided kayak tour in Doubtful Sound. The deepest fiord in New Zealand, Doubtful Sound is home to a thriving community of fur seals, penguins, and bottlenose dolphins, but no to crowds of people! Kaikoura is a picture-perfect kayaking location, framed by snowy peaks in one direction and the open Pacific Ocean in the other. But most importantly, Kaikoura is the wildlife-watching capital of New Zealand. The big stars here are humpback whales, which you may be lucky to spot (from a distance) from a kayak. 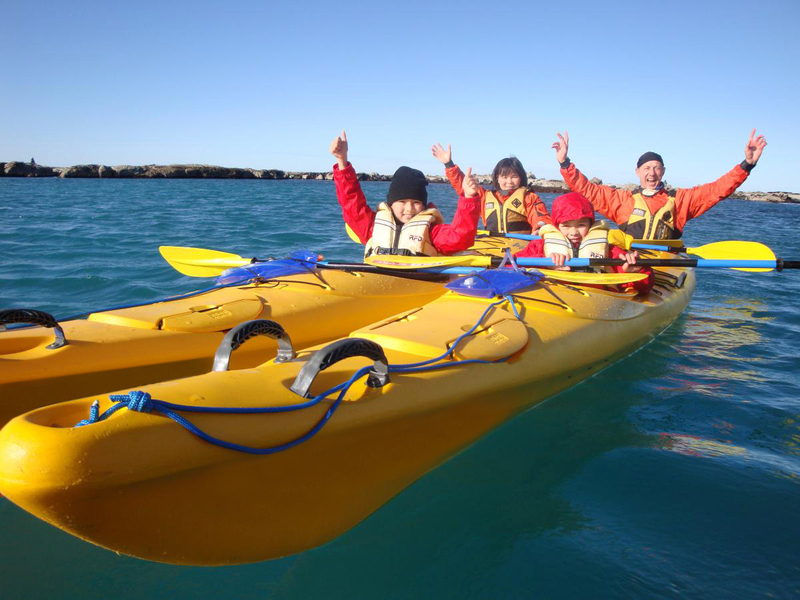 Closer to shore on a family-friendly kayak tour you’re guaranteed to get cute seals and playful dolphins sharing the water with you. The stealth-like kayak gives you a much more intimate wildlife encounters than you get from the bigger sightseeing boats. The West Coast of the South Island is loaded with breathtaking natural beauty, and its glacier country is arguably the best of the lot. Franz Josef and Fox glaciers are set among some stunning landscapes: schist-covered cliffs, grassy valleys, and snow-capped mountains. Unless you’re up for serious mountaineering, though, the easiest way to appreciate it all is at Lake Mapourika. 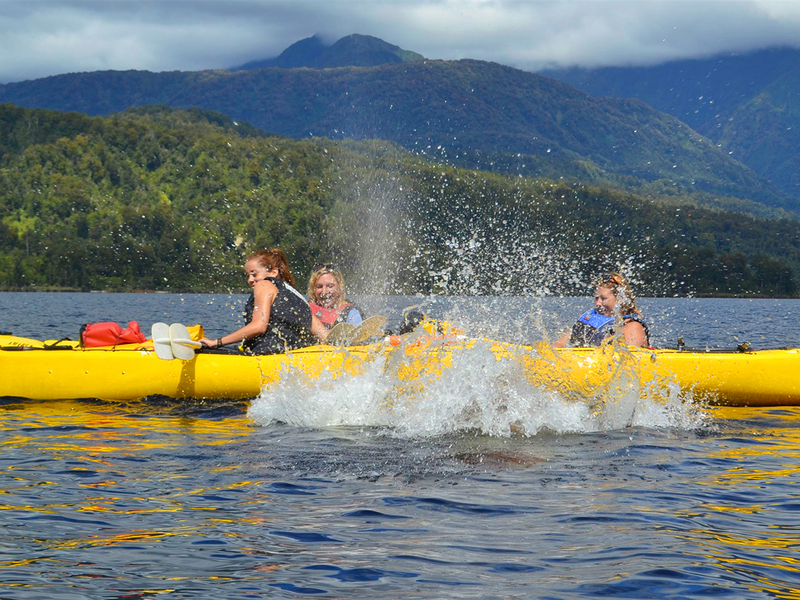 A family-friendly kayak tour here takes you from the mirror-like lake down smaller creeks fringed by virgin native forest, where you can see New Zealand’s rarest kind of kiwi, the Rowi, at a protected sanctuary.